Did you ever wonder how body movement happens? Or what is a reflex arc? Or how a motor neuron transmits electrical impulses? I always wondered how our bodies function. Always wanted to know how and why things happen, from the molecular level to the organic and systemic level, all being just amazing processes that keep us happy when normally functioning, which we tend to take for granted. Sensory receptors stretch in leg extensor muscle when stimulus is applied (eg hammer tap stretches tendon), while electrical impulses are transmitted from motor neurons through the bundles of axons in each neuron and all the stimulated (innervated) muscle fibres respond by contracting (stimulus response). Most sensory neurons in humans synapse in the spinal cord rather than passing directly into the brain, allowing reflex actions to take place relatively quickly by activating spinal motor neurons without delay of routing signals through the brain. Nonetheless, brain will receive sensory input while the reflex action happens. Two types of reflex arc exist: autonomic – affecting inner organs, and somatic – affecting muscles. 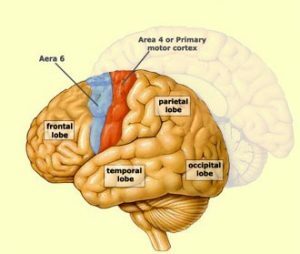 Did you know that even though the cerebellum accounts for approximately 10% of the brain’s volume, it contains over 50% of the total number of neurons in the brain?! Still, motor commands are not initiated in the cerebellum; all the human body’s voluntary movement is controlled by the motor cortex, located in the rear portion of the frontal lobe, and divided into two main areas (Area 4 and Area 6 – see photo). Amazing and interesting things happen in our bodies, all of which keeps us happy and healthy individuals enjoying our social life and interactions. Based on the same principle, when we overdo things or wrongly do things, due to a poor understanding of these basic rules, our bodies suffer, sometimes with major consequences for us. Do you want to know & understand more? Just ask the expert!